31 Jan 2019 – My copy of Homer’s The Odyssey, a remnant of high school Latin days, has been gathering dust on a shelf for decades now. But I’ve been thinking more about the book in recent years, especially as my writing has increasingly turned to the psychology of propaganda. In that context, one of the epic poem’s most provocative passages chronicles the brief encounter between Ulysses and the Sirens during his ten-year voyage home from the Trojan War. 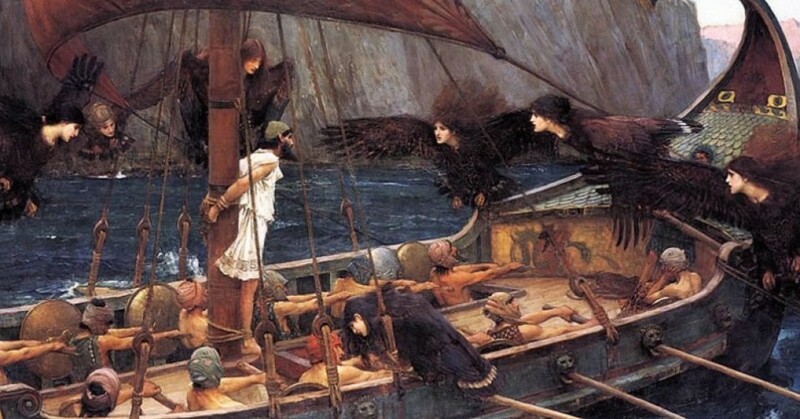 But Ulysses and his crew escape this fate, thanks to guidance from the goddess Circe. Her advice is clear and effective. Upon approaching the Sirens’ island, the crew should put wax in their ears and then bind Ulysses securely to the ship’s mast. In this way, he alone can safely listen to the enchanting songs, which purport to bestow wisdom and foretell the future. Odysseus is tempted by the swirling Sirens in Homer’s The Odyssey. So why consider this 3,000-year-old story now? Because for many Americans hoping to help steer our beleaguered country toward greater justice and equality, a pair of modern-day—albeit figurative—Sirens are seemingly always poised to draw us off course. Indeed, their beguiling appeals and promises will only grow louder and more persistent as we move ever closer to Election Day 2020. Not surprisingly, the first—and more ruthless—of the two is Donald Trump, with full-throated support from the Republican Party leadership. His repetitive refrain of fearmongering and racist dog-whistling—all under the guise of “Making America Great Again”—lures not only the intolerant but also some who are insecure and despairing. By contrast, the second can be found within the establishment wing of the Democratic Party. Sadly, its own chorus promotes skepticism toward any progressive proposal—for example, a Green New Deal or Medicare for All—that could disrupt a status quo very favorable to the super-rich and powerful. These two Sirens certainly don’t sing identical songs. But both rely on the same choir directors for their music: namely, the behemoths of corporate America, including Wall Street, the oil and gas industry, military contractors, health insurers, Big Pharma, and media conglomerates. That’s why we’re serenaded with “only a huge defense budget can keep us safe;” “higher taxes on the wealthy will cripple our economy;” “a single-payer healthcare system can never work here;” “climate change disaster can be averted with small steps;” “minimum wage hikes will force mass layoffs;” and other similar claims. All are broadcast far and wide, even though they lack substance and run counter to the common good. Defenders of the billionaire class, from both sides of the aisle, also have prepared verses to advance the prospects of their don’t-rock-the-boat candidates. So we can expect to hear much of the following in the months ahead: dismissive critiques aimed at progressive leaders—young and old—whose vision and fearlessness threaten the existing order; angry condemnation of those who note troubling inconsistencies in the words and actions of so-called mainstream politicians; duplicitous efforts to label leftist reformers as out-of-touch “extremists” whose dangerous ideas won’t sell in Middle America; and overblown tributes focusing on “civility” and “bipartisanship” rather than the unflinching pursuit of justice and the public interest. An abundant supply of wax and sturdy rope isn’t the answer for resisting the collective confusion and destruction wrought by today’s Sirens. That’s because we can’t afford to close our ears to their self-serving messages that mislead so many, nor can we afford to listen to their lies and distortions without responding. Unlike the challenge faced by Ulysses and his crew, these are voices that must be defeated, not merely escaped. A contemporary Circe might therefore offer a different recommendation for our circumstances: what psychologists call “attitude inoculation.” The basic idea comes from the familiar public health approach used to prevent contracting and spreading a contagious virus. Consider the flu vaccine. When you get a flu shot, you receive a modest dose of the actual influenza virus. Your body responds by building up the antibodies necessary to fight off the full-blown virus if it later attacks as you go about your daily life. A flu shot doesn’t always work, but it improves your odds. The favorite mantras of today’s corporate-backed politicians are much like a virus that infects the public with false and harmful beliefs about what’s happening, what’s right, and what’s possible. So here too, inoculation is essential. Knowing that these hazardous appeals are heading our way, we must be vigilant and prepare in advance for the onslaught by learning to recognize deceitful claims and by developing cogent counterarguments to them. Once we’ve personally acquired this psychological “immunity,” then we’re ready to be first responders when it comes to inoculating others. To be clear, the Sirens I’ve described are far from the only obstacles to a brighter collective future, one in which hardship, mistreatment, and crushed aspirations are no longer a routine part of so many lives. But their manipulative pleas and cautionary tales, contrived to divert and divide, are undeniable threats to progress on the urgent journey before us. Roy Eidelson is a member of the TRANSCEND Network and was a member of the American Psychological Association for over 25 years, prior to his resignation. He is a clinical psychologist and the president of Eidelson Consulting, where he studies, writes about, and consults on the role of psychological issues in political, organizational, and group conflict settings. He is a past president of Psychologists for Social Responsibility, associate director of the Solomon Asch Center for Study of Ethnopolitical Conflict at Bryn Mawr College, and a member of the Coalition for an Ethical Psychology. Roy can be reached at reidelson@eidelsonconsulting.com. Anticopyright: Editorials and articles originated on TMS may be freely reprinted, disseminated, translated and used as background material, provided an acknowledgement and link to the source, TMS: In a World of Corporate-Backed Politicians, Beware the Sounds of Sirens, is included. Thank you.